I decided to wear my ideal spring outfit, despite it still being cold for it. Yes, it is too much to ask to wear a blazer instead of a winter coat. 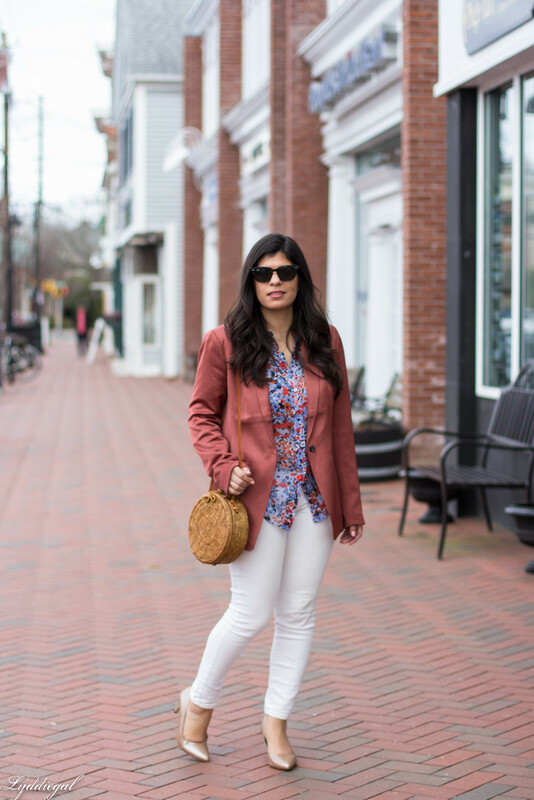 Funny how when I was just starting to transition into fall, I reached for this particular floral blouse, and it's what came to mind when I wanted to wear something decidedly spring-like. The perks of lingering winter weather? My favorite seasonal drink at Willoughby's Coffee Shop, the Mexican Spice Mocha remains on the menu, and the hot beverage is just what I needed to keep my hands warm. I've put away my gloves for the year in protest, but it's really a lose-lose situation. There is a promise of 60° on Saturday, but if happens, it will only be a brief reprieve. Winter keeps rearing its ugly head in KC, too- we'll be warm for a day or so, and then here comes a cold front (sometimes with snow!). 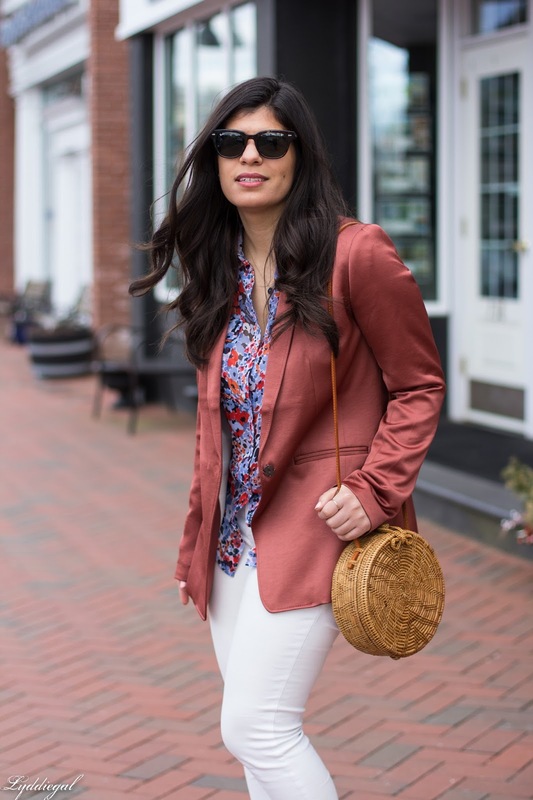 I'm loving your floral blouse and the straw bag gives it a spring-y pop! We've been lucky lately in the weather department, but I think you're showing how you can still look springy and yet keep warm!!! This blouse is so perfect because the colors span the spring to the fall!! I think that is the sign of a great item when you reach for it during multiple seasons! It's nicer weather for us today and tomorrow then snow predicted again next week. I could take the weather in the 40s and 50s this time of year but the low 30s is ridiculous. 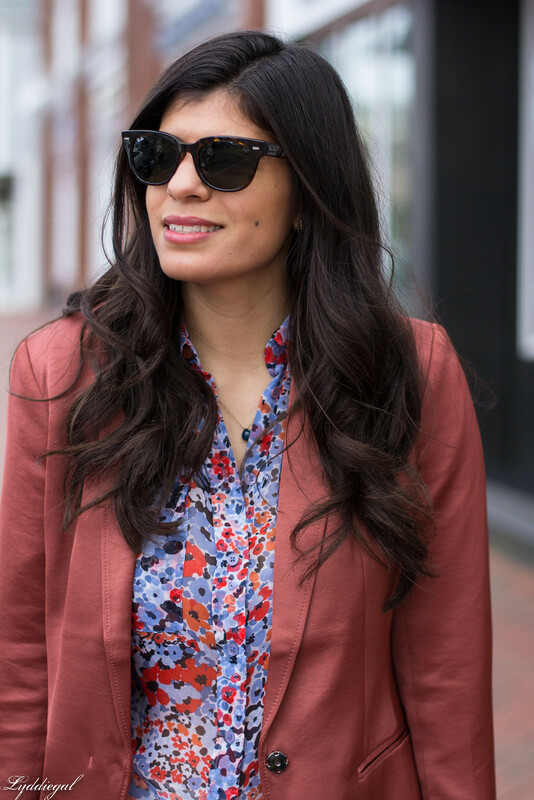 I adore the look and color of this blazer. It looks like it feels amazing. Hope the weather warms up soon. I love this look! And it is a beautiful ideal spring outfit :) I feel ya on the cold! There is still so much snow on the ground and more predicted for this weekend - please call for help haha! Soon we will both be enjoying some sunshine and our full spring wardrobe ;) Keep thinking spring! Cute outfit and love your handbag! I feel like you're single handedly going to usher in spring - and I love it! This is the perfect spring outfit, even if the weather won't cooperate with you. 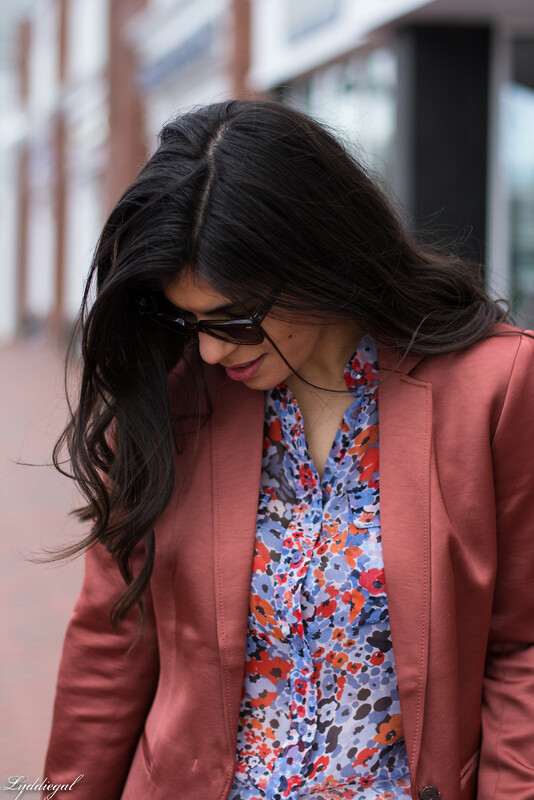 I really like the colour combination of the blazer and floral blouse together. I'm hoping you get some warm weather soon. I'm waiting for it to cool down here, I have so many scarves I want to wear but it's the second month of autumn and still not scarf weather yet! Hope you are having a great week so far! I'm feeling a bit under the weather unfortunately, trying to rest up (as much as you can with two kids, ha!). Love this look, is so nice! That's a beautiful spring outfit! The blazer brings just the right pop! I'm sending you warm weather vibes from here! I love that you are pushing past the cold weather and dressing for Spring! You go girl! 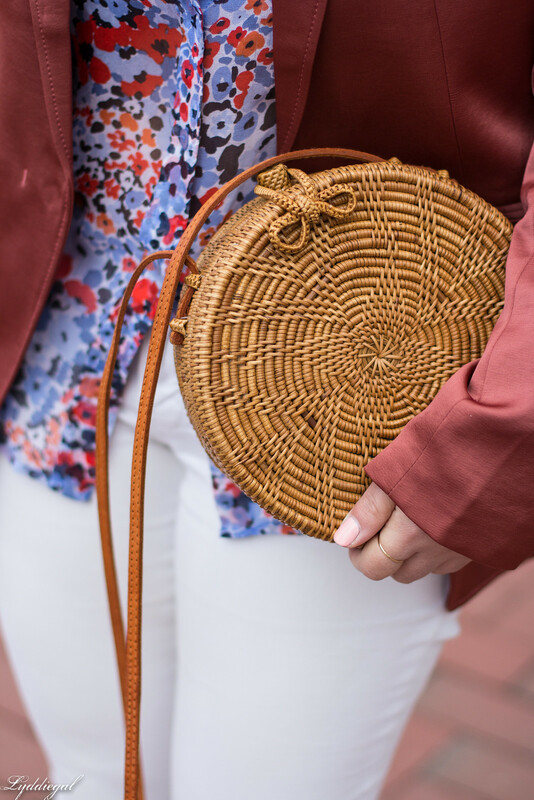 This outfit is perfect for early Spring and I love that bag. Thank you so much for your kind words yesterday. They were so greatly appreciated. Have a beautiful day. I really love that printed top. It's such a pretty color combination! And loving it with the blazer as well! I love the colors in this outfit and of course that bag! I really love this look! The bag is so cute! This really is such a great "welcome spring" outfit, even if the weather isn't quite cooperating yet. I love the color of that blazer. We had beautiful weather for a few days this week and I thought FINALLY winter was over... but I just looked at the forecast and the high is in the low 40s this weekend. ICK. But I'll try to look at the bright side and enjoy some hot coffee and tea. 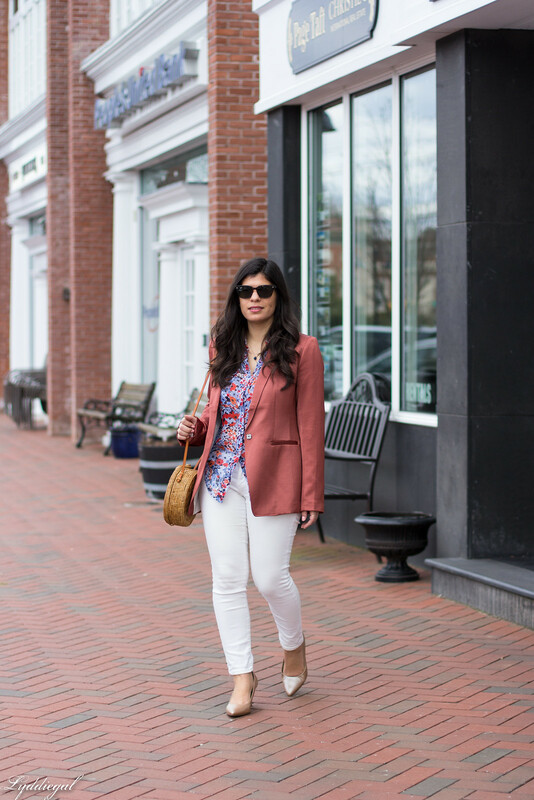 Blazer is also my go-to this season, and I love it! It's so comfy and versatile. YOurs is really cute dear, love the color, really pretty with your floral top and white denim pants. Cute bag you got there too! It isn't funny and yet, it is a little -after just spending a week in Vancouver, where it was warm but rainy, I was relieved to come back to Winnipeg and get a bit of fresh air. While I'm still impatiently awaiting the arrival of spring, it turns out I'm a bit fussy about how I want spring to be and humid, rainy days are still not for me. 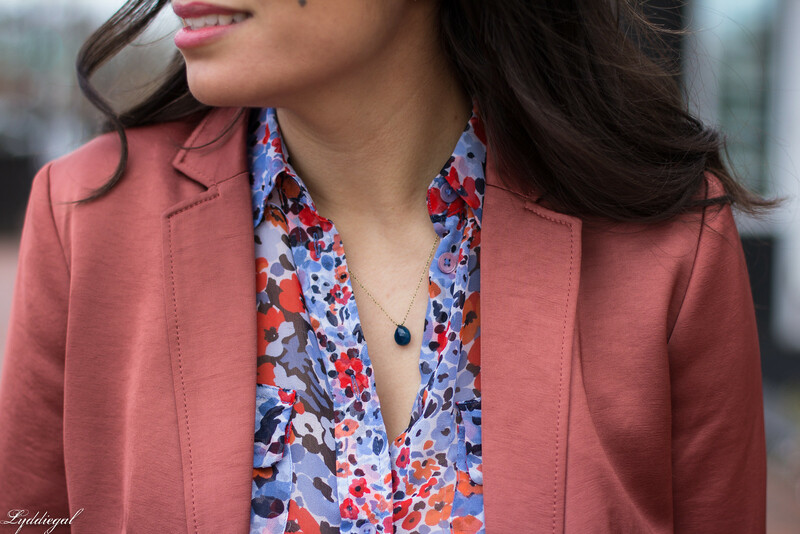 I do love the colour of this blazer even if I would be extremely hesitant to experiment with it myself, and I think it coordinates beautifully with the subtle floral print on your blouse. Lydia is a fashion lover, photographer and collector of shiny things. Loves a great sale, and occasionally remembers to stay on budget. I may receive commissions from clicks or purchases made through links on this blog. Thanks for supporting Chic on the Cheap.